I’ve never thought of myself as a person who is scared of heights. I happily peer over the edge of cliffs, I’m somewhat of a roller coaster addict, and flying in airplanes has never bothered me. Hang gliding and skydiving are both on my list of things to do eventually. But, travel teaches us about ourselves, and I have learned that I am not always thrilled with what I find. I am, indeed, a person who is scared of heights. Or, to be more specific, I am scared of a certain kind of heights. 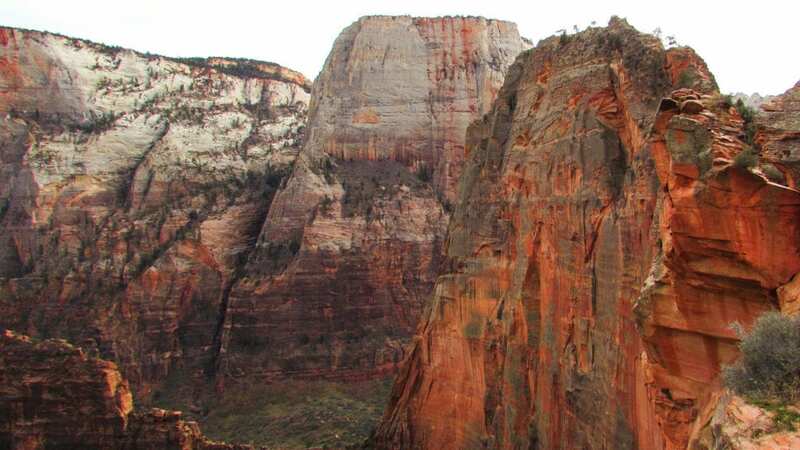 The primal part of my brain picked a very unfortunate time to go into a panic over being perilously perched in the sky: about 80% of the way to the top of Angel’s Landing in Zion National Park, Utah. At the beginning of this trail, it had never occurred to me that I would have any trouble climbing it. Despite the dangers listed (Zion National Park does publicly state that there have been deaths on the trail), I was confident–not even a week before this moment I was happily traipsing up and down the Grand Canyon. I had no history of being scared of heights. I had no reason to worry. Can you see the hint of panic on my face? The giant ledge to the left in Angel’s Landing, our would-have-been destination. The final piece of the Angel’s Landing ascent is a ridiculously narrow piece of “trail” that is essentially a small path, raised more than 1,000 feet in the air, with nothing but death on either side. No wall, no safety net. I found myself wishing for a harness to strap myself into the chain that made up the only handrail. Don’t be ridiculous, I told myself. People do this all the time. My mind was on board, but my physiological responses were not convinced: I was beginning to get dizzy with panic. One more step. One more step. Don’t be ridiculous. Just focus. Think about the view! And then, I looked up. I knew better than to look down, but looking up and ahead was almost as bad: in the distance, I saw two people climbing back down the trail–having to look down and face the ground in order to do so. It hit me: even if I made it up, I had to come back down. The next few moments are a blur: I called to Jeremy behind me, “I can’t do this!” and started quickly (dangerously) high-tailing it back down the trail. I can’t remember whether or not I pushed past Jeremy on the inside of the trail, or went around him on the outside: both would have been insanely dangerous in my mental state and I still get terrified every time I think about it. I didn’t stop racing until I got all the way back down the challenging, chain-laden part of the trail to wide, solid ground–this was about a quarter of a mile of dangerous scrambling that I almost certainly did not do as safely as I should have. Looking back on it, I believe that this was one of the handful of times in my life that I have had a legitimate panic attack. 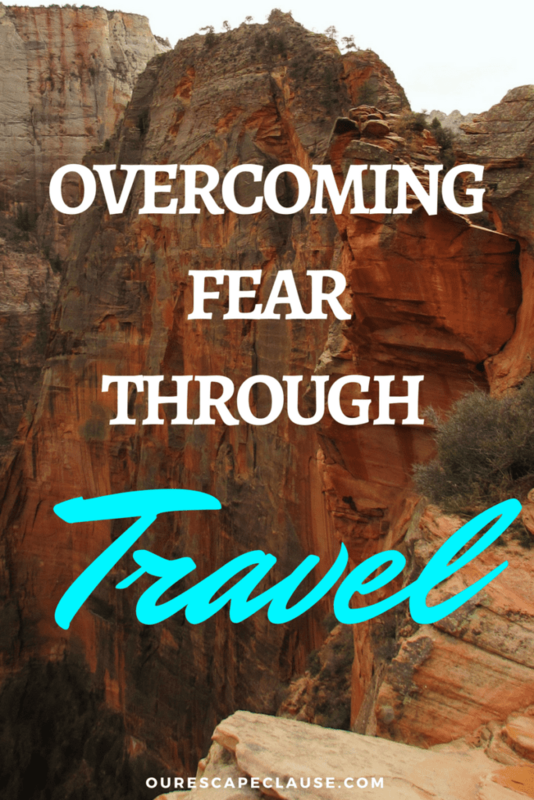 After my failure to hike to Angel’s Landing in late 2015, I was determined to ensure that the level of panic I experienced there never happened again. There was only one issue: I consider myself to be a fairly intuitive person, but I didn’t have enough data to fully understand why I suddenly became so scared of heights. The trail was dangerous, true–but I had been on lots of dangerous trails. Other than my panicked state, I couldn’t quite identify the issue. Luckily, I didn’t have to wait long to find out. During our visit to Split, Croatia in 2016 I was excited to climb the Saint Domnius Bell Tower. 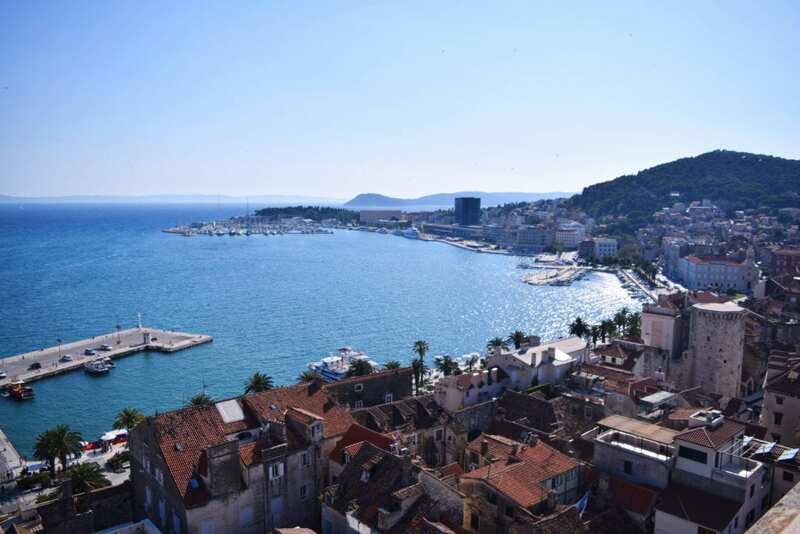 I thought it would be a great way to get beautiful views of the port of Split and the Adriatic Sea. 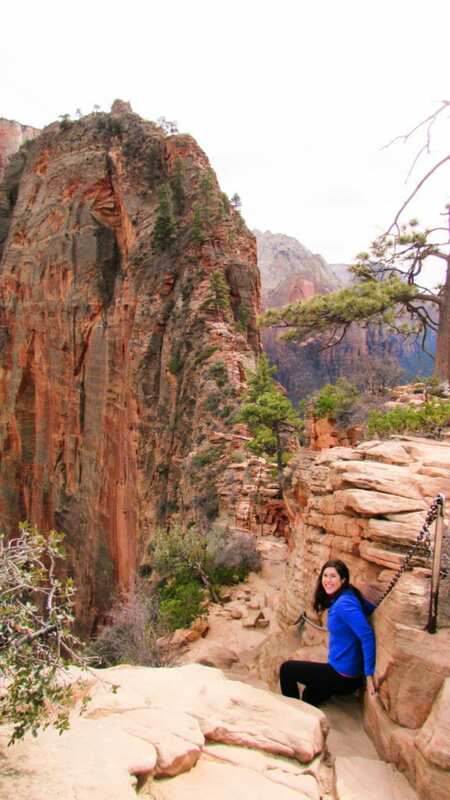 Like at Angel’s Landing, I didn’t even consider that it would scare me, because of course it wouldn’t! 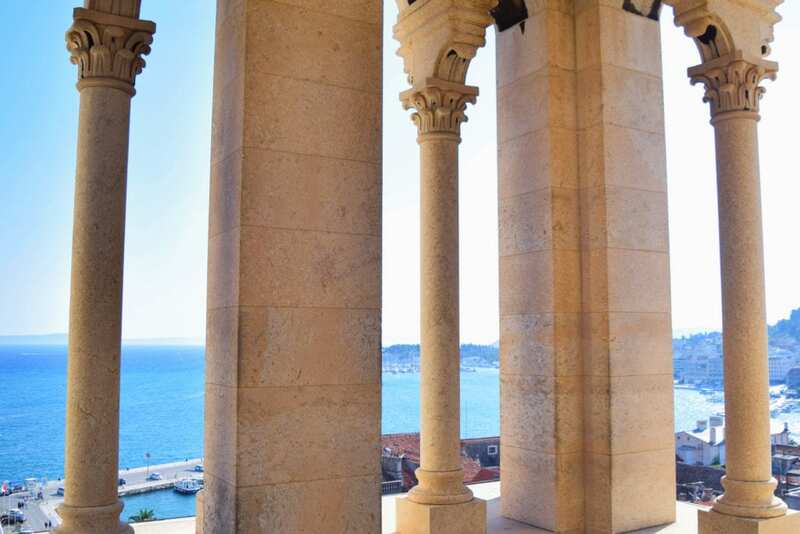 The Saint Domnius Bell Tower is open to the city after the first part of the climb: as you ascend, you have clear views both ahead and to each side, with the shaft of the bell tower on one side and the city on the other. There are “safety rails”, but they are set extremely far apart, and while I imagine falling is unlikely, it sure doesn’t look difficult to go careening onto the pavement with very little effort. I only made it about 40% of the way up the tower before I could feel myself panicking again. This time, I knew when I hit my limit: I stopped climbing when I acknowledged that mind was not going to overcome matter on this one. Jeremy continued up without me (he says the views are gorgeous), and I swiftly made my way back down to a “safe” platform about 20% of the way up the tower to wait for him. During this wait, I mulled over the reasons for my failure to complete the trip, and finally nailed down the reason for my panic: heights in general weren’t the problem. Cat-walk style heights that offered no “safe zone” to either the right or the left were the problem. This revelation made me simultaneously annoyed and determined: now that I knew what the problem was, I had something to beat. I haven’t fully conquered this fear yet–I suspect that it will be a long, possibly lifelong war. I’m sure that my fear will win some battles–but I’m also sure that my determination to beat the fear will win out the most. 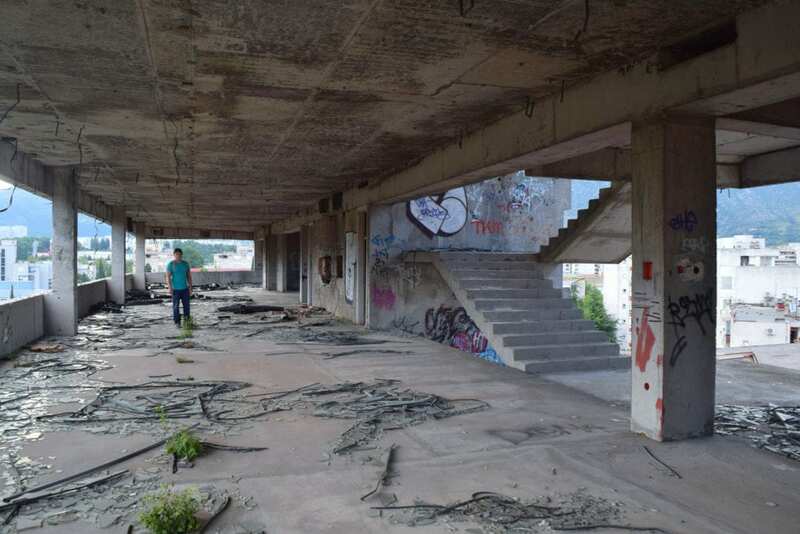 Just a couple of weeks after my unfortunate encounter with the Saint Domnius Bell Tower, I found my first opportunity to overcome this fear: an abandoned bank building in Mostar, Bosnia and Herzegovina. 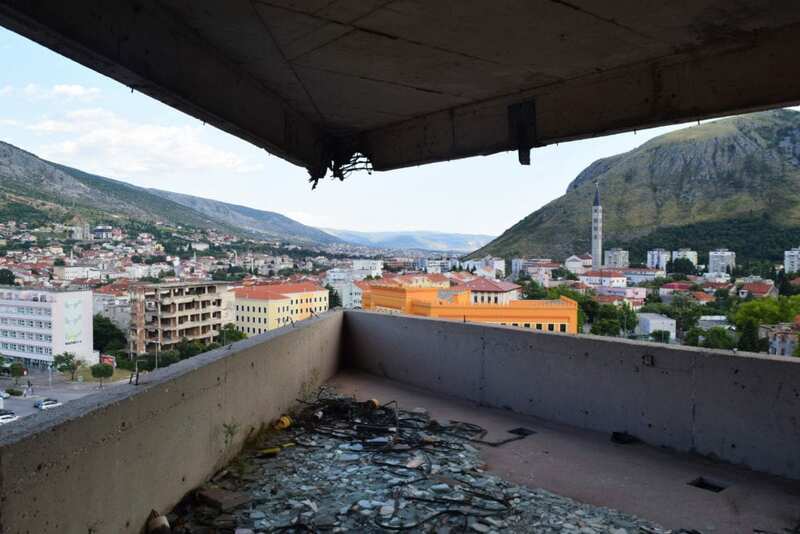 Mostar still bears enormous scars from the civil war of former Yugoslavia in the 1990’s–one of these scars is Sniper Tower, an eight-story former bank building that was bombed and subsequently turned into a sniper perch for Serb and Croat forces to pick off Bosniak citizens (the frequency and legitimacy of these attacks, like many things surrounding the civil war, seem to vary in accuracy depending on whom you ask). Today, this building is home to some dramatic street art and is popular with both locals and tourists. 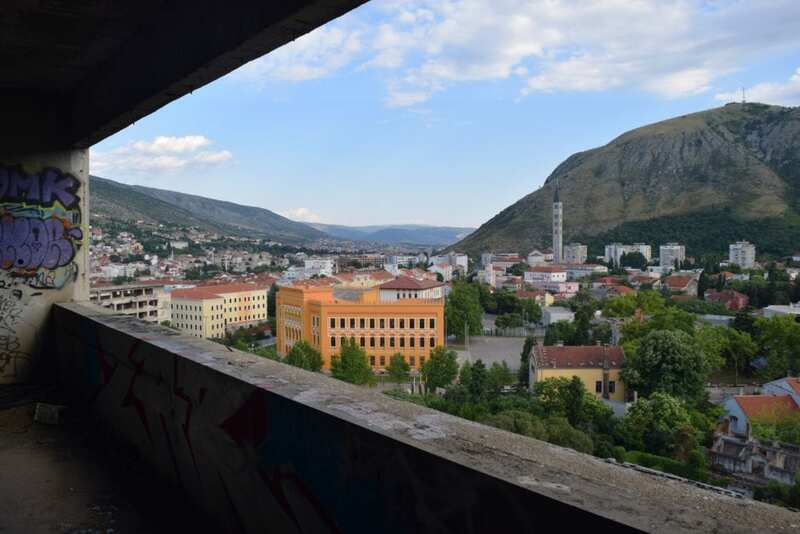 A climb to the top will be rewarded with beautiful views of Mostar, and being in the building itself paints a picture of the war that is heartbreaking and worth seeing–the bombed bathrooms and gigantic piles of glass from the window panes that once proudly covered the building both hit me hard. To climb up, you use the concrete staircase on the back side of the building. There’s just one problem: the walls are gone, and both sides of the staircase offer sheer heights–a drop to the ground on one side, and a drop to the next floor (if you’re lucky) on the other. I must admit, a small part of me was excited to see this and put my newly identified fears to the test. One step, two step, three step, four step. It wasn’t easy–I could feel my heart beating faster with each floor–but knowing the reason for my fright seemed to help keep it in check. 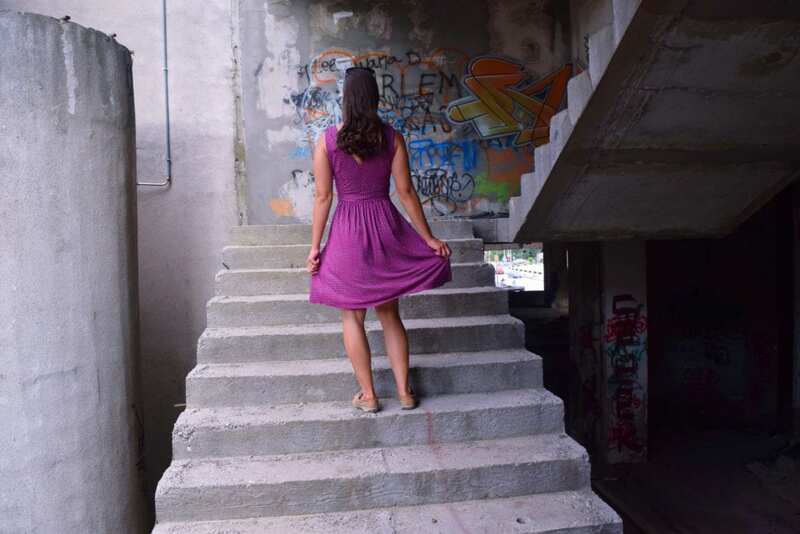 I was also able to stop on each floor and retreat away from the staircase to “safer” spots in order to regroup, which I think was enormously helpful with staying calm. At the end of the day, I made it both up and down without too much of a fuss (though, Jeremy and I did miss climbing onto the roof–apparently, that requires finding a different staircase once on the highest floor, which we didn’t see). I am thrilled to have made a small bit of progress on being scared of heights–objectively, I would rate the Mostar building as more dangerous than the bell tower, and less dangerous than Angel’s Landing. 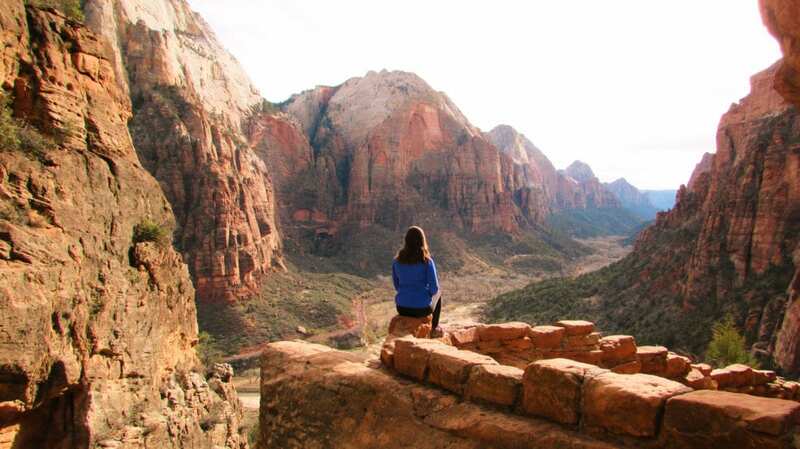 One day, maybe, I’ll go back and conquer Angel’s Landing–but I don’t expect that to be anytime soon.